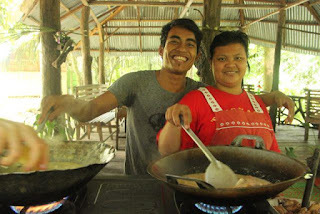 'Tangkahan - The Hidden Paradise' is a blog from me, Rika, living in the UK, and a business site from a lovely couple Tina and Agung from Tangkahan. I met the two on my trips to Tangkahan, and Tina became my daughter. Now we are working together to build one of the businesses running eco-tourism in the area. There are wonderful lodges and fantastic opportunities for adventure and learning, and those two wiull be advertising the tours and will be organising everything for a wonderful stay. 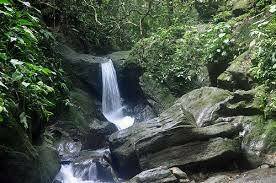 Tangkahan is really rather remote, about 100 km East from Medan, the capital of Sumatra, Indonesia. Half of the way the street is ok, the rest has a lot of potholes. It leads through palm oil and the occasional rubber plantation until it ends at the most beautiful jungle forest. 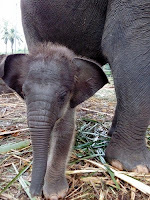 Apes and monkeys, hornbills and eagles are waiting to be discovered, either on foot or on the back of the elephants. The people who live in Tangkahan were illegal loggers back in the 90s and then decided that they need to turn the wheel round. Eco-tourism became their new business, and I could not imagine a better place for it. Every business however has flip sides, eco-tourism must be controlled, there is still the danger of destruction of forest by palm oil plantations, more jobs are needed as the children of the villages grow up, language and cultural gaps need to be bridged from both sided, the visitors and the locals. Hence education is key on many levels. This poor access road to Tankgkahan in a way is a good protection against floods of tourists who camp or encourage cheap entertainment. Tankahan needs people willing to appreciate the wonderful nature and the fantastic efforts of guides and lodge staff and pay what it deserves, so that families can educate their children - I was involved in kickstarting the English Club - and put effort, time, and money into presreving their wonderful environment. I promise you: You will have a trip of a lifetime! The elephant camp is near Green Lodge where I used to stay and where I met Tina and Agung. It is a 15 minutes walk from the visitor centre.The elephant family had grown by three babies since 2011, but 2012 desaster struck in form of a Herpes virus. I was there when Olive's and Yuno's babies, Tangka and Namo, died and we all were devastated. We had great hopes for the youngest one, Ame but she died in 2015. Theo the only bull in the family, however is an old charmr with the ladies and Yuno now has a new babylittle and Nurbaya is a happy little fella. 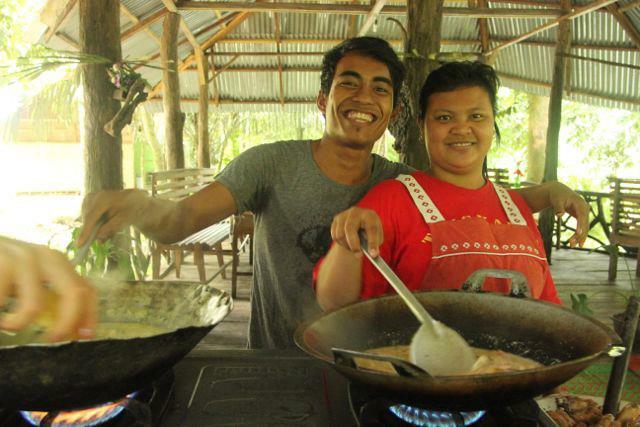 Please meet now Agung and Tina. I met them in 2012 when there was no sign of a romance and now they are married for a year already and going strong. They both are fantastic cooks and are running the operations at Green Lodge. However they felt that they would do even better in providing the service of bringing tours together and tailor entire trips from pickup at airport to hotel, stay, adventures - you want it, they make it happen for you!